3/07/2018 - Export Lion... the title says it all! FIT (Flanders Investment & Trade) presents its celebrated Export Lion award to companies that excel in the field of export. Now in its seventeenth year, Biobest is proudly competing to bag the coveted annual prize. During the first round, candidates from the medium and large enterprise category (50 or more employees) were reduced to just three nominations – Biobest, Manna Foods NV and beMatrix bvba. The competition is certainly stiff, and all three stand a good chance of following in the footsteps of last year’s winner, Skyline Communications, (HQ’d in Izegem). 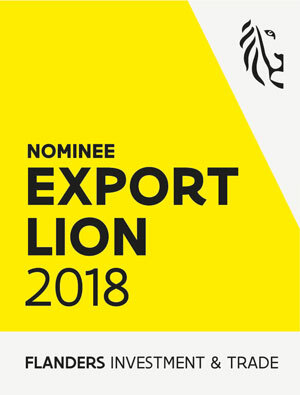 It’s not the first time that Biobest has been nominated for the Export Lion award. “We were among the best medium and large enterprises in 2014. Now, some four years on, with global exports of more than 74 million Euros and in excess of 1,000 employees worldwide, we’re stronger than ever. 2017 was also a record year in terms of growth, thanks to a number of major acquisitions,” says Jean-Marc Vandoorne, Biobest CEO. Biobest exports far beyond Europe. The natural Biobest products are of great importance to the horticultural sector worldwide. So, what is it that makes Biobest so successful in terms of exports? Biobest actively assists growers around the world with pollination and biological pest control, by offering bespoke guidance. Local consultants are on hand to provide growers with practical advice and support, and to help develop a personalised strategy. This dynamic approach, coupled with their flawless communication, rock solid logistics and global production network, leaves Biobest exceptionally well placed to scoop the Export Lion on 19th September 2018.